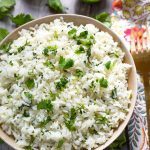 Instant Pot Cilantro Lime Rice is tangy & flavorful, but not overpowering. Fresh tasting and good on so many things. 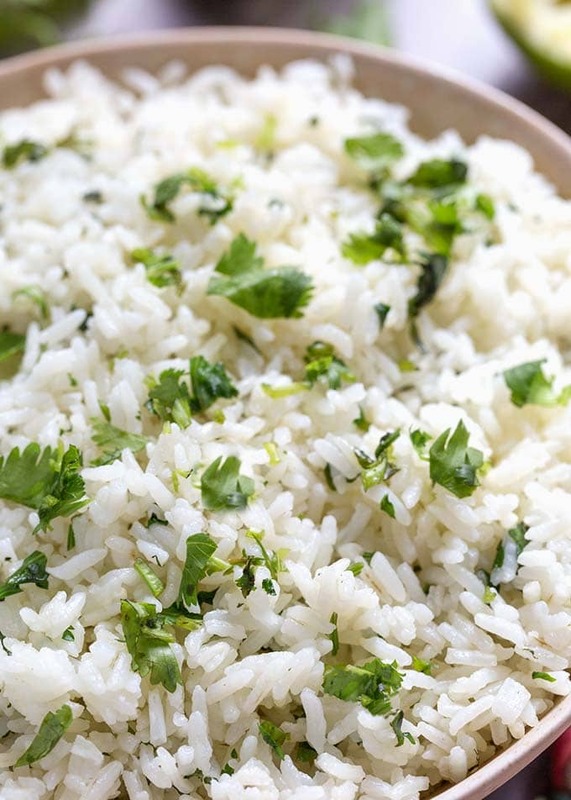 This pressure cooker cilantro lime rice is similar to Chipotle’s cilantro lime rice. Delicious with tacos and in burritos, or as a side dish to fish or chicken. Cooking rice in your electric pressure cooker can be tricky. Every variety of rice seems to have its own cook time! 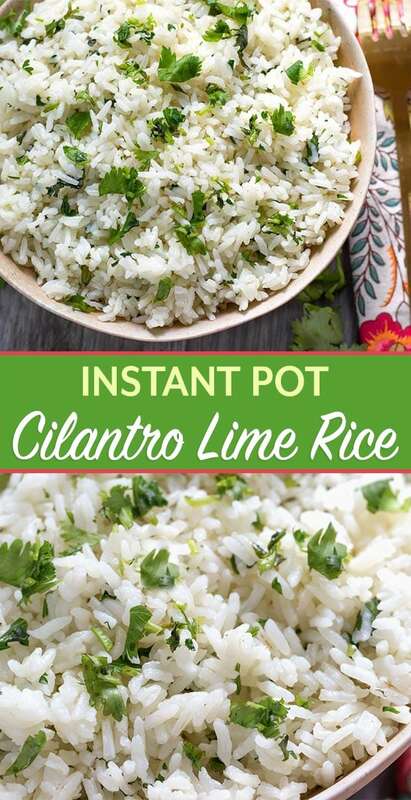 Today I’m going to show you how to make Instant Pot Cilantro Lime Rice. It’s a great easy recipe. 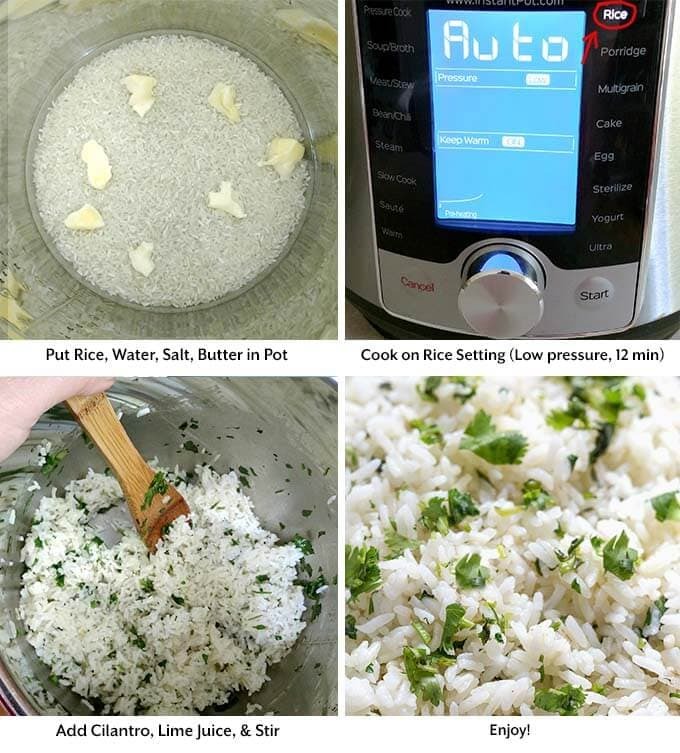 I use this method for plain white rice as well. It works every time, and I don’t dirty up more than one pot when I make it. If your pressure cooker only cooks on High pressure, then adjust the time to 3 minutes on High pressure and do a natural release of 8-10 minutes. If I decide to cook chicken, for instance, I would then put the rice. water, salt, and butter in a 6″ or 7″ diameter pan and set it on a trivet directly over the chicken and cook for 8-10 minutes on High pressure with a 5-8 minute natural pressure release. Lots of peole like Chipotle’s Cilantro Lime Rice. I have never been there, but was told this is similar. I’ll let you be the judge of that. You can adjust any of the flavorings to get the rice dish that you like best. So add more or less of the cilantro or lime juice to suit your taste! I kept the butter very light as it can easily get too greasy tasting, and this lighter taste is how I like it. 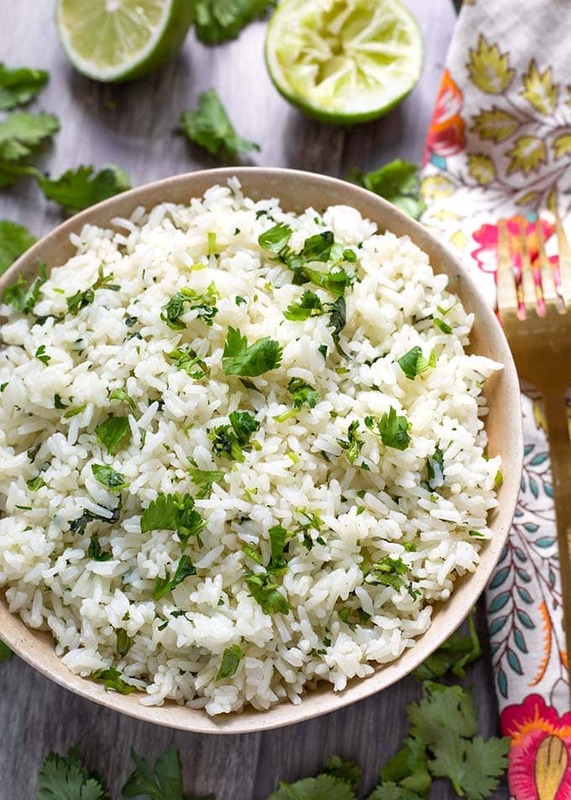 Instant Pot Cilantro Lime Rice is tangy & flavorful, but not overpowering. This is similar to Chipotle's cilantro lime rice. Great on tacos and in burritos. Add rice to the pot, then add water, salt, garlic and dot the butter on top (or olive oil on top). Place the lid on the pot and set the steam release knob to Sealing. Then press the Rice button, or use dial. The rice setting cooks on LOW pressure for 12 minutes (in case you don't have a Rice button, set this time/pressure). Then do a Quick Release of the pressure when done. If your pot doesn't have LOW pressure, set for 3 minutes at HIGH pressure, then let it do a 10 minute natural release. Then release the remaining pressure manually. Fluff the rice with a fork. Then add the lime juice, lime zest, and cilantro. Mix well. Taste and adjust seasoning. Serve with beans, or on tacos, burritos, and in burrito bowls. I loved this rice! I can’t believe how easy it is to make this! I used olive oil instead of butter and it was perfect! Hi Cora! I’m so glad you liked this rice recipe! I know, making rice in the pressure cooker is so very easy! As long as you have the correct cook time for the type you are making! Thank you for your review!